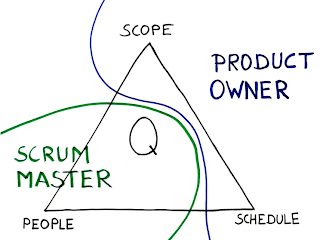 There is one element in Scrum which I really appreciate. 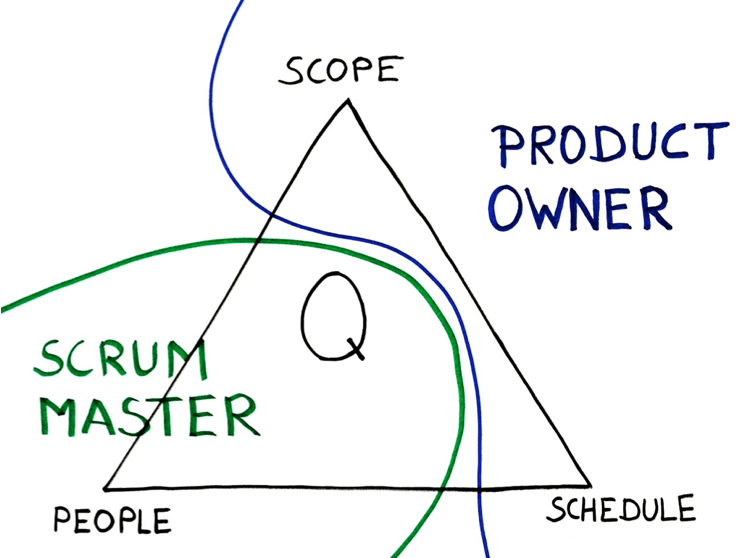 It is the separation of power in Scrum. What exactly do I mean with this? Democracies are based on the separation of powers they require. Each one has their rights and responsibilities. The other two watch out and make sure, that third doesn’t abuse it’s power. In totalitarian governments this is not given. One entity reigns over all three. The usual result is that a few benefit and many suffer - from individuals to whole economies. What does this have to do with Scrum. Well, nothing - at least at a first glance. But if we apply this concept to classical management, the project manager has the possibility to act as a dictator. 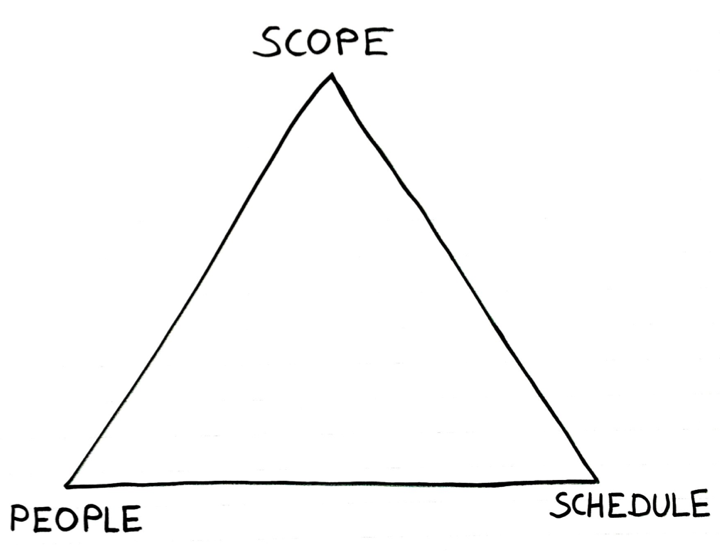 He or she can decide about all three elements: scope, schedule, people. 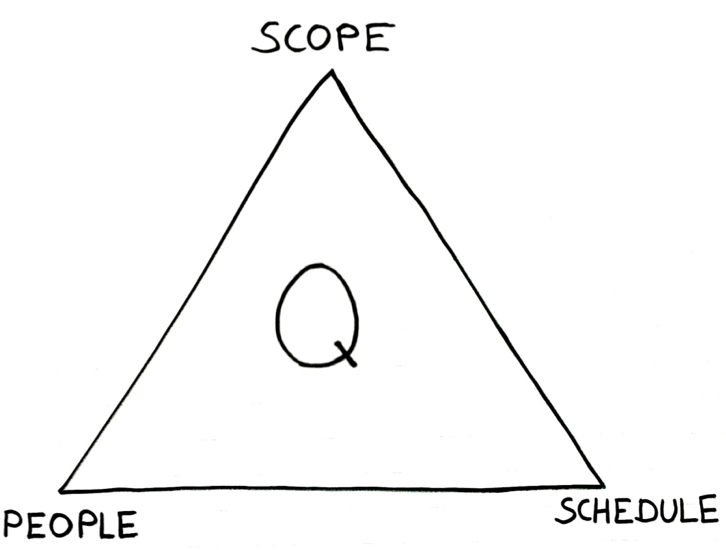 The image above is the incomplete ‘iron triangle of quality’. It tells us, you can choose two out of the three, the third has to give. For example, if we have a certain amount of scope to implement by a given date, we need to adjust the number of people working on it. 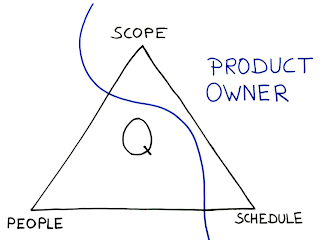 If all three are set then the quality of the product under development will be sacrified when things get tough. Quality is the forth hidden element. Often the manager tries to convince us about the attainability of the goal with sentences like ‘I know it is aggressive but …. ‘, ‘You are not a team player ….’ and more. How is this handled with Scrum? 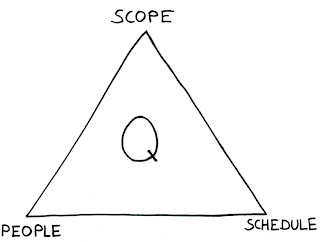 In Scrum the Definition of Done (DoD) states certain attributes or activities which have to be present in order to guarantee a high quality, potentially releasable product. The compliance of the DoD is paramount to a high quality product with happy customers and low TOC. Now Scrum is not immune to crunch times, times when the Product Owner (PO) is tempted to push the Development Team a little further. In those situations it would be just to easy to abandon the DoD and reduce quality to keep the date and make the Product Owner happy. This is when the Scrum Master comes in. She will make sure that the DoD stays enforced and keeps the PO at bay. Essentially she protects the people (Development Team) so that they can work in the agreed way and thereby create a high quality product. 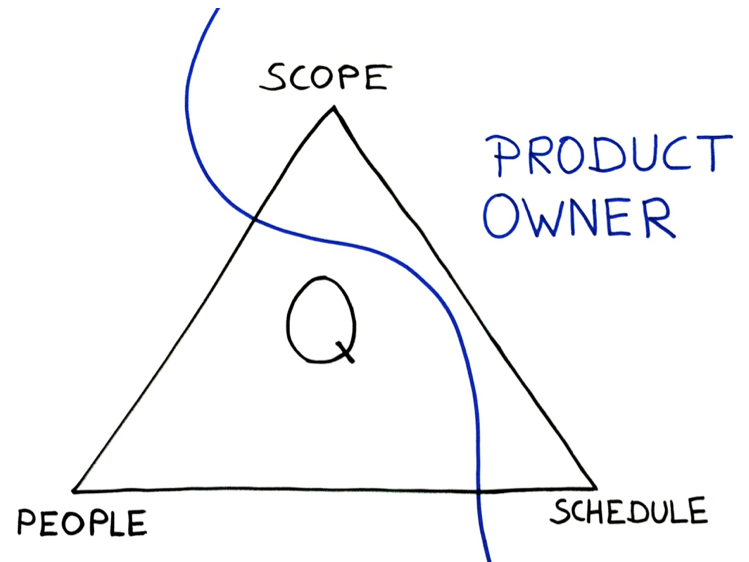 In Scrum the Product Owner has the right to decide which feature gets developed in which order. His tool for that is the Product Backlog. and the Scrum Master ensures that the Delelopment Team has the right to estimate the work according to the Definition of Done and to implement it according to the Definition of Done. The separation of power protects the Development Team and allows it to deliver high quality product increments throughout the project. This sustainable approach guarantees high quality software with high ROI, low TCO -- easy to maintain, easy to support, easy to enhance -- for a long time. Best, you should see happy, engaged developers. In the end everybody wins! 2.) Quality --> Dev Team and SM. I think that the Dev Team is responsible for the quality first. 3.) 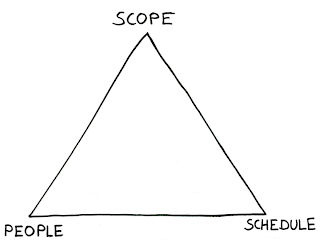 People --> The teams are usually selected by the company. The SM can only protect the people he has, but he has often not much power when the company reduces team size. 4.) Dates --> The due dates are also given by the company often. Or even more often by external events like law changes, marketing pressure, etc. Great job explaining an important concept under girding scrum. The separation you outline is exactly what forces org's to deal with the reality of the situation, instead of fooling themselves until the "end of project crisis" when reality and plans finally reconciled. I like the triangle: everything has its price. Quality first. What doesCheap wow gold this must do with Scrum. Well, pretty much nothing - at the very minimum with a important glance. but once we put into action this idea to classical management, the job manager hasBuy rs gold the probability to work as obtaining a dictator. Since it is Chinese Clothing an intense color, wearing red clothing ought to be avoided through negotiations or confrontations. Life is like a hot bath. It feels good while you're in it, but the longer you stay in, the more wrinkled you get rs gold, Life is too short to wake up in the morning with regrets. So, love the people who treat you right and forget about the ones who do not Runescape Gold, In the Orient young bulls are tested for the fight arena in a certain manner rs gold. Each is brought to the ring and allowed to attack a picador who pricks them with a lance..
Nice Post, Scrum enhances team productivity and collaboration , better customer satisfaction and less bureaucracy as the communication is done in daily scrum meetings individually.